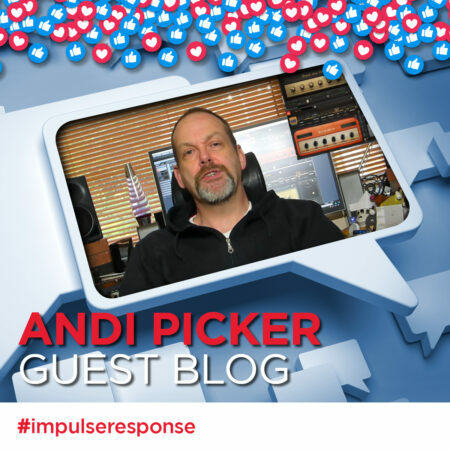 Hey folks, my name’s Andi Picker (yes, for real) and I’m a guitar player and audio engineer. I started recording my own guitar parts as a hobby many years ago with just an SM57 and a 4-track cassette recorder, and along the way, somehow managed to make it all far more complicated than it needs to be. I’ve spent years since then figuring out and trying to explain how to make getting great recordings simple again, with articles and videos online and in the ‘Making Tracks’ recording column in Guitar Interactive magazine. Almost anyone who plays electric guitars will admit to at least a passing obsession with tone; we’ll happily claim that it’s “all in the fingers”, but still spend hours researching the picks, strings, pickups and NOS valves that will take us a step closer to what we hear in our heads. For most of us, it’s a lifetime journey; a goal that we might get close to but never quite reach. Along the way though, there’s another tone goal that’s probably even more important – consistency! Well, it Sounded Good Yesterday! Is consistency really that important? Remember that thing about tone being in the fingers? Well, to a large extent it is – how hard we hit the strings, pick angle, how we mute; it all affects what we hear. Once upon a time my only amp was a JCM800 with a 4×12 cab, and at the sort of level that I could practice at, the amp would crunch one day and be flat and dead the next. Room temperature, humidity, time of day – if I looked too hard at a knob the sound would change and I’d go from fluid (well, sort of fluid) picking one day to hacking at the strings the next to try to hear what I was doing, which is incredibly unhelpful when you’re trying to develop your muscle memory. I had a similar problem when I started recording – a part I played today would not sound the same as a part I played yesterday, especially after the cat decided that a microphone on a stand was something that had to be hunted and killed, or when we had to move the gear into another room or studio. Can’t I Turn It Up – Just a Bit? Live?! ; that JCM800 and 4×12 sounded great when we played far too loud in rehearsal, and it might sound awesome on a loud stage with a good front of house engineer, but on a ‘quiet’ stage, with the master volume set to ‘almost 1’ and a tatty SM57 thrown somewhere near a borrowed cab, I might as well go home. Still, I only really use a couple of basic sounds; imagine the nightmare for a session player who has to dial-in multiple tones for specific songs, perhaps to play or audition for an established band or artist, and has to have the confidence to nail both songs and sounds all night long in unfamiliar venues. A lot of the problems we face with trying to get a consistent sound are to do with getting amps running to a level where they work properly. Now, up to the point where until we use a real speaker to move real air we don’t have any actual sound, so we don’t have any problem with it being too loud. A tube amp just needs to ‘see’ a correct speaker load, so with a good load-box we can turn our amp up to the exact point where it sounds great and then take a line level signal to a recording interface or PA. No cab means no noise to worry about, but we also miss something hugely important – the final sonic filter that the speakers add to the sound of the amp. The good news is that we can add the effect of the speakers (and more) by using a cabinet simulator with speaker impulse responses (more commonly known as IRs). An impulse response is a recording of a signal played through a real speaker in a real cab, recorded with one or more real microphones. By loading one or more IR files into a suitable hardware or software IR Loader we can add the effect of the speaker, cab, microphone type, microphone position, and in the case of distant mics, the room, to our optimised amp signal, and mix it through our PA or recording software at just the level we need. The Perfect Studio – Anywhere! Move the amp to another studio or another stage, and the speaker and mic setup stays exactly the same. Got a great sound engineer with great gear? Give them a feed complete with your cab impulses and they’ve got your sound, dialled-in and ready to go. Not such a good sound engineer or not so good gear? Give them the exact same sound, ready-made, and they just need to put it in the mix. Perhaps we don’t want to use a real amp? Run a digital processor or software amp sim, or perhaps an analogue amp-in-a-box through an IR cab sim and we’re in business with the sound of real cabs moving real air. If I’m working with someone remotely, they can use the same cab in the same room that I used, wherever they are; if we’re working in software, they can use the same amp too, and if we’re writing a piece of music with a particular sound in mind, we can create the sound and make it a part of the performance, just as we originally heard it. Is there a downside to impulse responses? There can be: poorly recorded IRs will make everything that’s played through them sound bad, and it’s quite possible to get so bogged down in a massive impulse response library with hundreds of very similar IR files that nothing actually gets done. I generally limit my use of software amps and cabs to a small number of high-quality simulations of models similar to those that I use in real life – and as every cab I own is loaded with Celestion speakers, I’ve leaned towards the Celestion Plus IR libraries to keep my life simple. The other possible downside of having such complete control is that we can get a little bit analytical and miss out on the happy accidents that occasionally occur with hardware. So I‘ll sometimes mix it up a bit by trying a few random options, like a Plexi through an AC30 type cab, or a Twin through a 4×12 with V30s. It’s easily enough done, and I don’t have to worry about breaking anything if I crank a 100W Hi-Watt through a single 30W Greenback! Anyone who’s worked around electric guitars for long enough will know the feeling of getting ‘the sound’ and then trying to re-find what we think we had. Those Celestion Plus IRs take moments to set-up and put a great microphone in the right place in front of a great speaker every time; the rest of the rig can be set-up do what it does best and the engineer gets to drink coffee and worry about the drummer for a change.